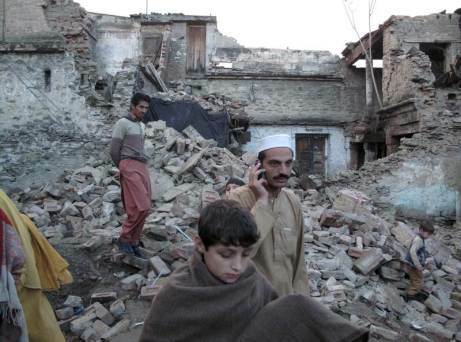 A major earthquake struck the remote Afghan northeast on Monday, killing at least 135 people in Afghanistan and nearby northern Pakistan and sending shock waves as far as New Delhi, officials said. In one of the worst incidents, at least 12 girls were killed in a stampede to flee their school building in the northeastern Afghan province of Takhar, just west of Badakhshan province where the tremor's epicentre was located. "We were very scared ... We saw people leaving buildings, and we were remembering our God," Pakistani journalist Zubair Khan said by telephone from the Swat Valley northwest of the capital Islamabad. "I was in my car and, when I stopped my car, the car itself was shaking as if someone was pushing it back and forth." In Afghanistan, a total of 33 were reported dead on Monday. In addition to the 12 schoolgirls in Takhar, seven people died in the eastern province of Nangarhar, two in Nuristan province in the northeast, three in eastern Kunar province and nine in Badakhshan, officials said. In Pakistan, 102 deaths were reported by early evening, most in northern and northwestern regions bordering Afghanistan, officials told Reuters. Particularly hard-hit in Pakistan was the northern area of Chitral, where 20 people were killed, police official Shah Jehan said. The death toll was likely to rise because so many areas were cut off from communications, he said. Journalist Gul Hammad Farooqi, 47, said his house had collapsed. "I was thrown from one side of the road to the other by the strength of the earthquake. I've never experienced anything like it," he said. "There is a great deal of destruction here, and my house has collapsed, but thankfully my children and I escaped." Further south, the city of Peshawar reported two deaths but at least 150 injured people were being treated at the city's main hospital, the provincial health chief said. "The problem is we just don't know. A lot of the phone lines are still down," said Scott Anderson, deputy head of office for the U.N. Office for the Coordination of Humanitarian Affairs in Kabul. "Right now we are collecting information," he said.